An anthology series that centres around horrible children getting their comeuppance, often in horribly gruesome ways. Tracey McBean invents her way through sticky situations with the help from her best friend, Shamus Wong. These are the disastrous stories that will make the Real King Arthur (wherever he's buried) turn in his grave. 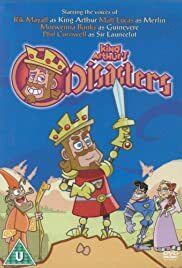 In this new animated series King Arthur is the short, generally good natured leader of Medieval Britain, who seeks the hand of the lovely shopholic princess Guinevere. In each episode, the lovestruck Royal tries to woo Guinevere who sets him impossible tasks that (you guessed it) ends in disaster. Helping him in these really silly tasks is his ONLY best friend , the incompetent wizard Merlin not to mention his Highness's horse, Alan. Fun, rather goofy at times and really funny, this is a must see for fans of British comedy, and especially for fans of the talented Rik Mayall who voices the title character.